Talk About It. Your Story Could Change A Life. Stamp Out Stigma first launched in 2013 by ValueOptions in response to the December 2012 Sandy Hook Elementary tragedy. The country was experiencing a national crisis around mental illness in which stigma was playing a large part. The initial intention of Stamp Out Stigma was to help people feel comfortable talking about mental illness and addiction and eliminate the surrounding stigma by adhering to the three R’s: recognize, reeducate, and reduce. It did not take long for the initiative to gain popularity. From Stamp Out Stigma posters in the workplace to a pledge to talk about mental illness and addiction to social media platforms encouraging people to share their stories, the word about Stamp Out Stigma spread quickly. People from all over the nation started to ask about the campaign and what they could do to help Stamp Out Stigma. In April 2014 the Association for Behavioral Health and Wellness (ABHW) became the umbrella organization for the Stamp Out Stigma initiative. Several ABHW member companies joined the Association recognizing that stigma hinders people from talking about their illnesses and seeking treatment. Our hope is that by challenging every one of us to talk about addiction and mental health, we can transform the dialogue from a whisper to a conversation and Stamp Out Stigma. 1 in 4 adults experience a mental illness in a given year, according to the National Alliance on Mental Illness. That’s approximately 61.5 MILLION Americans a year. 22 MILLION people have a substance use disorder. Addiction and mental illness diagnoses are more prevalent than heart disease, diabetes, arthritis, migraines, osteoporosis, and asthma; yet misconception and misinformation have left many people with substance use disorders and mental illness afraid to talk about their experiences or seek help. » 15,000 Pledges in 2015. The goal is for 15,000 people to have taken the Pledge to Stamp Out Stigma. By sharing their stories and encouraging others to talk about mental illness and addiction in 2015, people will be honoring their pledge. » More Twitter Chats. #SOSChats were very successful in 2014, and the conversations will continue in the coming year. These chats involve mental health, substance use disorders, and various topics such as self-care and general well-being. » Interact More with Supporters. Stamp Out Stigma wants to learn more about its audience. We encourage our followers to share their mental health resolutions with us and tell Stamp Out Stigma how they plan to honor their pledge to Stamp Out Stigma in 2015. Resolutions can be posted on the Facebook page or tweeted to us using the handle @StampStigma. Through the Stamp Out Stigma website and active social media platforms, people are encouraged to take the Pledge and share their own personal stories. Taking the Pledge is just one step in reducing mental illness and addiction stigma, but it has such an enormous impact on the way people view mental health and substance use disorders. Many people believe that recovery is not possible and speaking about mental health and addiction is uncomfortable. Misunderstanding and lack of knowledge may deter people from reaching out and getting the help they deserve. By taking the Pledge, you are committed to changing the way mental health is viewed today. Talk about it. Talk about why mental illness and substance use disorders are important and why the topics should have a larger audience. Stamp Out Stigma challenges people to change perceptions and reduce the stigma of substance use disorders and mental illness by talking about them. Pledgers commit to recognizing, reeducating, and reducing substance use disorders and mental illness. In doing so, they are beginning the path to raising awareness and understanding of addiction and mental health needs and ultimately removing the stigma, thereby encouraging people to seek the treatment they need. Taking the Pledge means more than writing your email in a box and hitting submit, it means changing the way people think about and discuss mental health. It means changing your lifestyle and making the Pledge a reality. A healthy conversation starts with a solid education. Learn more on the Stamp Out Stigma website about addiction and mental illness and how to change misconceptions. Taking the Pledge to Stamp Out Stigma is an important first step. “As a supporter to those who have a mental illness or substance use disorder, I understand the importance of recognizing the high prevalence of mental illness and substance use disorders. I also know that when recognition is coupled with reeducation and understanding, health-seeking action can be taken. These actions lead to recovery, which is possible for everyone. If you would like to take the Pledge to reduce the stigma surrounding mental illness and substance use disorders, please join us here. Even if you are not living with a substance use disorder or mental illness, you can make a lasting impact by speaking up for those who do. You can do so by following Stamp Out Stigma on Facebook, Twitter,YouTube, and Pinterest, where you can learn about others’ experiences and share your own. 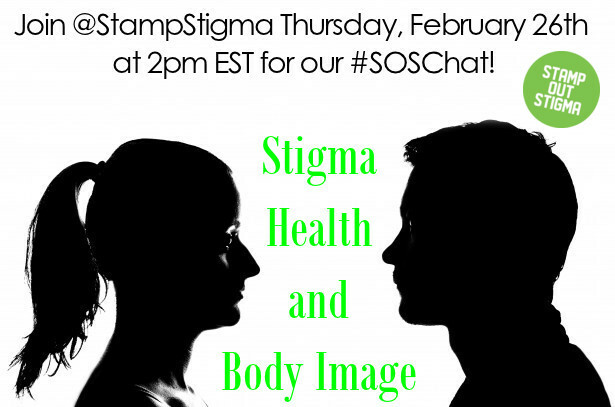 Be sure to join Stamp Out Stigma on Twitter for the #SOSChat on Stigma, Health, and Body Image on Tuesday, February 26th at 2:00pm EST. ABHW is the national voice for specialty behavioral health and wellness companies. ABHW member companies provide specialty services to treat mental health, substance use, and other behaviors that impact health to the nearly 150 million people served by its members.